The brand new novel from the Sunday Times bestselling author Paige Toon. The perfect summer read for 2019! HOW DO YOU FIND WHERE YOU'RE GOING, IF YOU DON'T KNOW WHERE YOU'RE FROM . . . Angie has always wanted to travel. But at twenty-seven, she has barely stepped outside the small mining town where she was born. Instead, she discovers the world through stories told to her by passing travellers, dreaming that one day she'll see it all for herself. When her grandmother passes away, leaving Angie with no remaining family, she is ready to start her own adventures. Then she finds a letter revealing the address of the father she never knew, and realises instantly where her journey must begin: Italy. As Angie sets out to find the truth - about her family, her past and who she really is - will mysterious and reckless Italian Alessandro help guide the way? 'Heart-warming, wistful and full of joy . 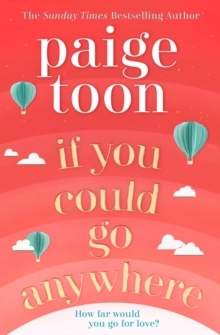 . . Paige Toon tugs on the heartstrings like no other; this is a beautiful book about someone searching for her place in the world and finding herself along the way' LINDSEY KELK`Warm, inspiring, like a holiday mood in book form' MHAIRI MCFARLANE `I LOVED If You Could Go Anywhere.